On 20 January we had the pleasure of seeing the public art documentary “Robert Irwin: The Beauty of Questions” at UCR Palm Desert Graduate Center. With more knowledge of the artist and designer of the central gardens, we particularly enjoyed a docent led garden tour on 25 January. 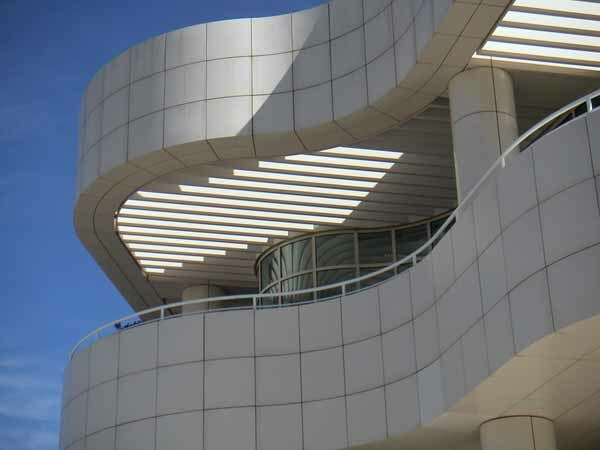 This was our fourth visit to The Getty Center and it is really such a treat to savor: one of our favorite built environments. It is an incredible site and there is so much attention to detail. We marveled at Richard Meier‘s attention to design from the overall to the minute. Robert Irwin‘s art-garden has matured very pleasantly over the years, and it was great fun to see in the winter without the leaves of the sycamores blocking some of the sight lines. It was quite amazing how much color was in the Central Garden (The link takes you to the Getty Center Plant list).Â Gorgeous succulents and grasses of all shades. There was subtle playing of shades of green, textures, and heights. 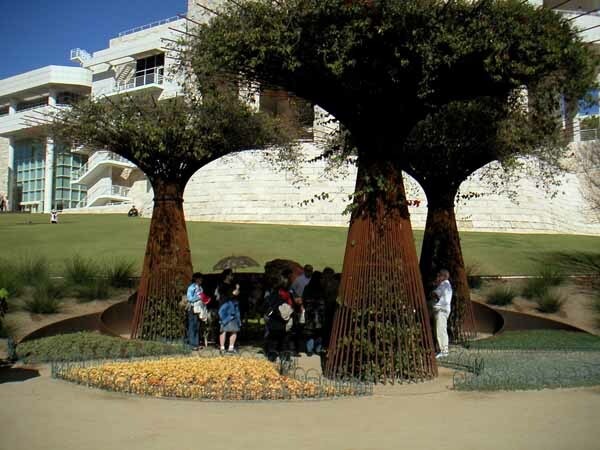 The docent reminded us that this was planned as a work of art first, not as a garden: rather the plants are the medium to express the art.Â I appreciate this approach! 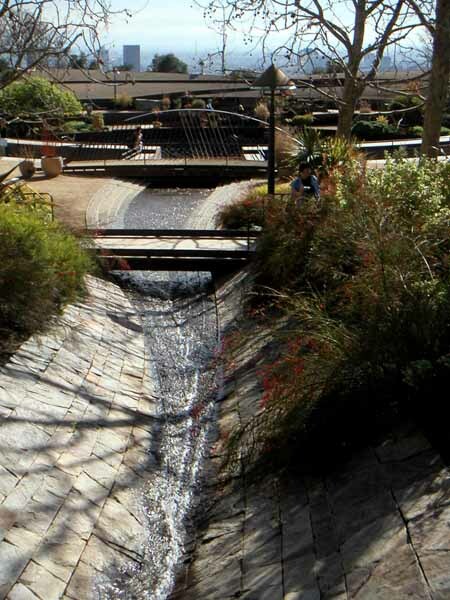 The design features a “natural” ravine and tree-lined walkway that led us through an experience of sights, sounds, and scents. Everything in the garden was selected to accentuate the interplay of light, color, and reflection. Irwin’s statement, “Always changing, never twice the same,” is carved into the plaza floor, to remind us of the ever-changing nature of this living work of art. After lunch in the excellent “cafeteria” and the garden tour, we enjoyed exploring the buildings and the art collections. What a collection! Everything from tiny illuminated manuscripts to large sculptures. 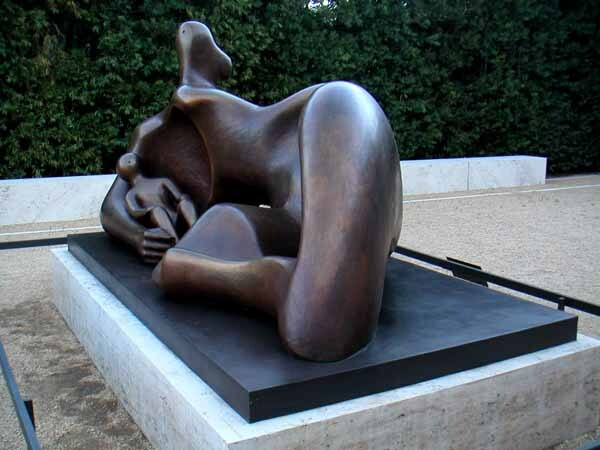 After having the Henry Moore sculptures in Denver, this one particularly caught my attention. This relationship between the mother and child represents so much of the essence of this architecture – the undulating form that reflects an exaggerated landscape, a shallow cave carved in the side of a rock to shelter her child, creating a haven and nestling place. 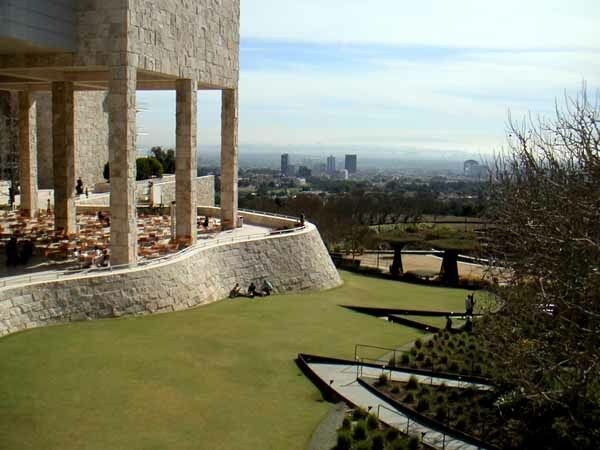 So it is with the Getty as it gazes out at LA – an independent physical form but so much a part of the spirit of the city. Thanks J.Paul for sharing with all of us! 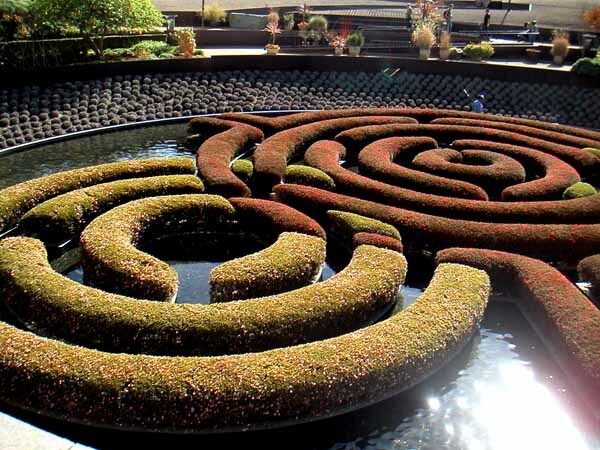 This entry was posted in Architecture, Art, California, Gardens. Bookmark the permalink.